Ground floor: Sitting/dining room (TV, DVD, WiFi) with patio doors to terrace. Kitchen (oven, dishwasher, microwave). Two single bedrooms. Two double bedrooms. Shower room. First floor: Double bedroom with en suite bathroom and patio doors to terrace. Outside: Terraced grounds of lawns, terraces and flowerbeds. Laundry room (washing machine). Covered dining terrace. In-built barbecue. Poolside shower. Enclosed children’s play area with swings. Table tennis. Private swimming pool (7m x 3.5m) with Roman steps and 'wave resistance' swimming option. We could not have envisaged a waterfront setting more stunning than that enjoyed by this charming holiday home and as the owner of Sotoxusto drew back the entrance gates and invited us in, we marvelled at the breathtakingly beautiful panorama that lay before us: shimmering enticingly beyond prettily terraced grounds, the sheltered waters of the Ría de Vigo provided the most captivating of scenes, their calm waters reflecting the undulating slopes lining the banks on the other side. Adding even further to the appeal, the sandy beach of Cesantes and its beachfront restaurant and beach bars was just 600m away. Stretching out along the shoreline in a series of tiered levels, this enviably positioned home sits amidst picturesque grounds of wide patios, foliage-strewn arbours, secluded lawns and children’s play areas, all of which look out across the water like a private viewing gallery, their lower section having direct access to the waterfront via ladder steps leading down onto the shore. It offers the most idyllic of retreats and this maritime ambience continues throughout the house itself, where a cheerful colour scheme of blues and terracottas perfectly complements the aquatic scenes so strikingly incorporated by the arched patio doors that line the entire width of the living room’s west facing façade. Upstairs in the principal bedroom the same view is captured through sliding doors that lead onto an equally enticing semi-circular terrace. 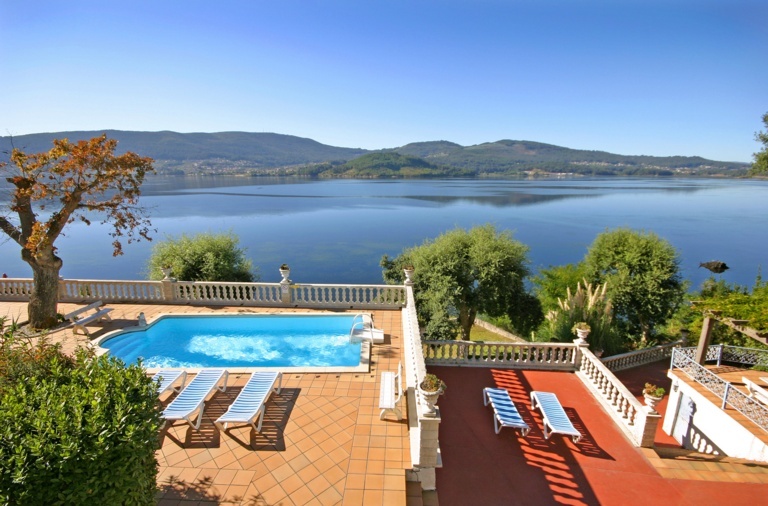 Being just a 600m walk from the sandy beach of Cesantes, guests at Sotoxusto will find themselves perfectly positioned to enjoy the picturesque surroundings of the Ría de Vigo, the fjord-like inlet whose sheltered waters are the source of some of the world’s finest seafood. Either wander down the lane behind the house, down some steps, to the shore itself to discover a typical restaurant and some summer beach bars or continue up another lane, crossing the single-track railway, to the village centre where all amenities are provided. The local train line, which passes behind the house, provides easy access from the small village platform to Vigo, Pontevedra and Santiago. With the beach so close you are sure to enjoy many a day relaxing and listening to the sounds of the water lapping the shore. There are also shops in the main town of Arcade selling fish, seafood and other fresh produce, and a good choice of seafood restaurants too. Craggy rocks to the west with steep cliffs and caves, and fine, white sandy beaches to the east. During summer months boats leave from many of the mainland towns. Take the ferry from nearby ports of Cangas or Vigo to this beautiful, protected island and stunning beach. The number of visitors per day is limited so make sure you book. At any of the port towns along the coast you are sure to find delicious, fresh seafood. Tapas are another great way to sample a variety of different types of dish and are available at almost all restaurants throughout the region. In Baiona especially, you can find a great choice of tapas bars one next to the other along a pretty cobbled street. In summer this is a great spot for people watching on the terraces outside. Head inland for hiking in the gorgeous countryside. With so much history, Galicia has so many old trails to follow and historic landmarks to explore.. The Serra do Candan is about an hours drive and has spectacular views, waterfalls and trails to explore. Other areas offer ancient stone carvings, Roman settlements and an abundance of wild flowers, birds and other wildlife to be spotted. Grab a map from any Tourist Information centre and get lost in nature. From the terraces that line the beach, sip a cocktail and see the spectacular sunset over the Atlantic Ocean in a unique setting. With a museum and a shrine, it is one of the best of its kind in Galicia. The views from the top of the hill over the Rio Miño towards Portugal and the Atlantic are breathtaking. Walk the cobbled streets of this fortress town and browse the shops selling pretty embroidered linen and towels for which the town is famous. During the 16th century, Pontevedra was the capital of Galicia and it has a very important port, Colombus' ship the 'Santa Maria' was built here. The old quarter is an intriguing maze of lanes, and delightful stone flagged squares to explore. The imposing castle, with drawbridge, portcullis and well preserved walls, has spectacular views from the battlements. Why not take a picnic to enjoy in the grounds. The museum contains maritime ethnography, nautical instruments and furniture and interesting archaelogical remains. In O Grove, built on a strip of land almost completely surrounded by the sea. Try the famous 'Pimientas de Padrón'. These tasy little peppers, originally from Mexico, are now grown throughout the region to meet the high demand.. Try them roasted in oil, but watch out for the occasional hot one! Dedicated pepper fans can visit the pepper festival held in the town in August. Music, processions, food-tasting, fireworks and traditional dancing are just some of the events that take place in the many fiestas held in the Pontevedra region during the summer months. There are a couple of surf schools based on the 'beach of waves' and a great view of the Cies Islands, plus lovely, fine white sane to lay back and relax on. There are numerous stone crosses in the village indicating it was once considered a very special place. Stop off for an Empanada in one of the little bodegas in the old quarter. The manor has 300,000 square metres of parkland and gardens, including rose gardens. Every summer live performances of all types of music, dancing and theatre are held here.